The cloth is made of 100% elastic polyester. The texture of our cloth is pleasant to the touch. 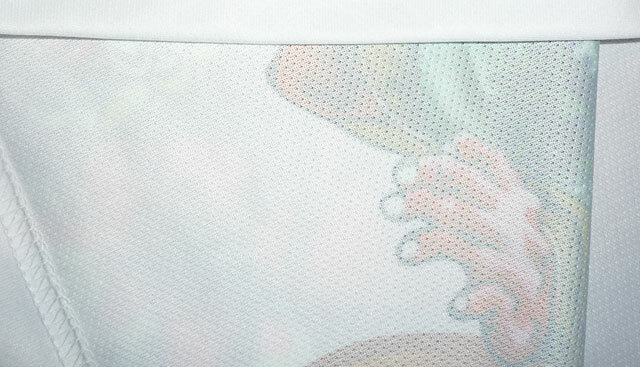 For the inner side we use mesh process.This allows the shirt to breathe and dry well. Non-Formalin Material is used for print, which is environmentally safe. Washing process using water is no longer necessary during dyeing, because we use dispersive dye(water paint) for the print. detailed design can be transferred beautifully onto fabric. We use thermal vacuum method to transfer the dye onto fabric. This technique improves dye penetration by removing excess air out of the cloth. Price of shipping is the same to any country around the world. All payments are made by paypal, for maximum efficiency and security. Before making an order you will need to set up your own paypal account through www.paypal.com. Depend on area. Normally, it takes 7 to 10 days from Japan to USA and Europe. If for some reason you are not fully satisfied, we will provide a refund for your purchase. We will not accept returns on products that have not been worn. If the garment has been washed or stained, we will not allow a refund. You will be responsible for shipping the garment back to us within 30 days of your order. Information on how to ship your product back to us is provided on the receipt supplied with your order. If you happen to lose it, please email and let us know what you would like to return. information to any outside parties. better serve you with pertinent information, such as order confirmations and order status updates. If you have any questions that have not been answered in the paragraph above regarding our privacy statement, the practices of this site, or your dealings with our Web site, you can contact us.